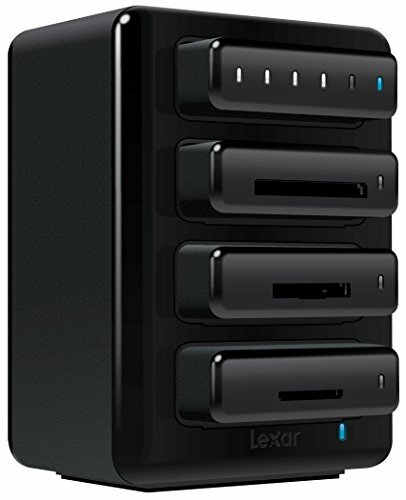 Lexar is among the top names in the industry, known for fast and reliable storage media and card readers for digital cameras and other devices. I've known about the Lexar Professional Workflow products for quite a while, but never quite bought into it. Last week I made the plunge into what will fast become an integral and important part of my workflow (no pun intended). 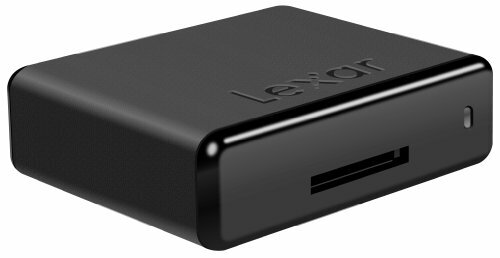 I've been using the Lexar Professional USB 3.0 Dual-Slot Reader (and prior to that, the USB 2.0 version) for as far back as I can remember. Both have been reliable and portable, perfect for use while traveling or on location, as well as for desktop use. However shuffling around card readers has become a chore over the years, and I wanted something that would stay on my desk for my file ingress needs. I don't personally like built-in card readers as I have had bad experiences in the past with their quality and reliability. Built-in card readers also have some limitations with media types they can accept, so often times, you may need a separate desktop reader anyway, defeating the purpose – additionally, my desktop's tower is in a place where I don't easily have access to it while sitting at the monitors. I had to look for another solution. I had known about the Lexar Professional Workflow line of products for quite a while, and while I loved the idea, I was never really ready to make the investment. Anything modular really catches my eye because of the flexibility and expansion possibilities. In this article I'll be covering the (cheaper, but no less capable) Workflow HR1, which features a USB 3.0 interface. 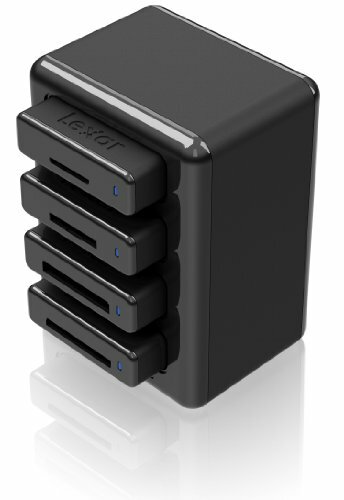 Lexar does make a (much more expensive) Workflow HR2, which features USB 3.0 and Thunderbolt 2 interfaces. The spec for throughput on USB 3.0 vs Thunderbolt is 5Gbps vs 20Gbps, so if you are importing lots of files or video at once and would make use of the extra throughput, that's a decision you'll have to make for yourself. For me, USB 3.0 has been fast enough for my needs, and I did not feel that the much more expensive ($85 vs $255 MSRP) Thunderbolt version was worth the extra speed. As I mentioned, the modularity of the Professional Workflow series of products is what caught my eye. Working with different devices that use all kinds of different media, having a mess of different card readers and adapters on or around your workspace makes for a lot of clutter. The Workflow HR1 consolidates all of your card readers into a single, attractive media "tower" where you can access and import all of your media. Different modules are available so you can customize the Workflow HR1 to your needs, and stow away any modules you may not need at the time. This combination will allow me to read and import media from any device I currently own, and significantly speed up my workflow, as you can import from multiple media types at once in a concurrent transfer (and even multiple cards of the same type, with the appropriate configuration). This eliminates a lot of clutter from my workspace, as well as help speed up the ingress of media. This is a REALLY cool option for backup. Being an SSD, it's extremely fast, and gives you an additional option to integrate into your backup process. The big plus is that these drives are relatively inexpensive — about $150 for a 512GB, which should be enough to store your current project(s) for temporary backup. Do note however, that the HR1 and HR2 are NOT standalone units, so you will not be able to use this in the field to backup your cards to the SSD module -- unless you have a laptop and external power for the HR1/HR2. Finally — and most awesomely — each of the modules that plugs into the Workflow HR1 can be used independently with its included USB 3.0 cable! So you don't even have to have the HR1 or HR2 to start building your media ingress solution. You can start with a few of the modules, and get the hub later. The HR1 is essentially a USB hub that will accept the compatible modules. It simply plugs into your computer via a standard USB 3.0 cable (or additionally, Thunderbolt, in the case of the HR2), and off you go. It should be noted, though, that in the case of using multiple modules, you will need external power for the HR1 hub (supplied, via an AC adapter). Once you plug in the HR1, you simply plug each of your modules into the hub, and from there, it works like any other card reader. One important thing to note is that Lightroom does not currently support concurrent transfers, so you will not be able to unload multiple cards at the same time into Lightroom (for example, an SD and a CF card) -- but concurrent transfer will work if you are just pulling files off of the cards directly to a folder, or in Capture One Pro 9 or Photo Mechanic, which makes pulling large amounts of data off multiple cards into a library VERY quick. For large-scale culling and selection, Photo Mechanic can't be beat. I think Lexar created an exceptional tool in the Professional Workflow series of products, and don't know why I held off so long. I spent just over $200 (tax included, via Amazon Same-Day) to get my hub up and running. What that may seem steep for a couple of card readers, The greatest thing about the compatible modules is that they work independently, so if you are thinking about buying into the Lexar Workflow "system", you can start out by buying the compatible modules — which are priced about the same as any other card reader (from $20-40, depending on the media type and connectivity) and simply purchase the hub later on. With that being the case, your commitment into the system is effectively zero, as you don't NEED the Workflow hub — but it does look nice :). So, if you're looking to declutter your workspace and want something as functional as it is pretty, the Lexar Professional Workflow hub and modules is a no-brainer.